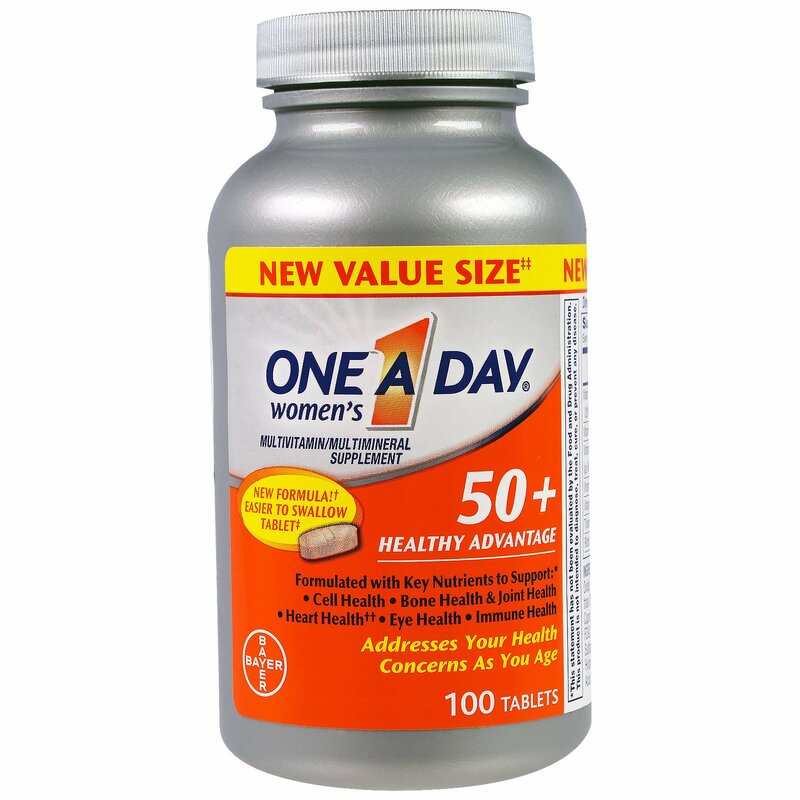 †300 mg of Calcium compared to 500 mg of Calcium in previous One A Day Women's 50+ Healthy Advantage formula. ‡25% smaller as compared to previous tablet. ‡‡ Compared to current One A Day Women's 50+ Healthy Advantage 65 ct.
†† Not a replacement for heart medications. 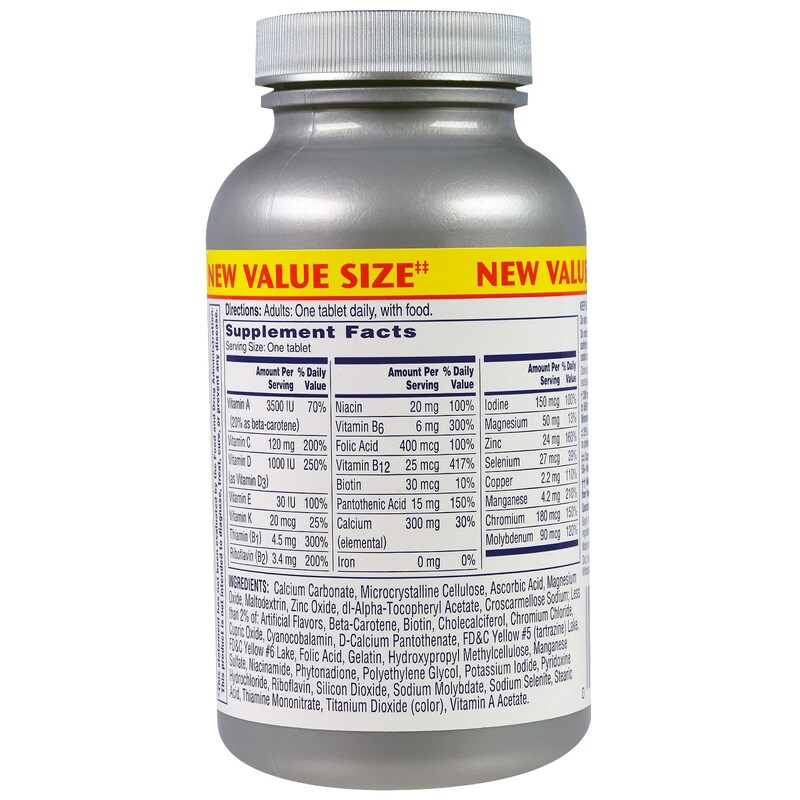 Calcium carbonate, microcrystalline cellulose, ascorbic acid, magnesium oxide, maltodextrin, zinc oxide, dl-alpha-tocopheryl acetate, croscarmellose sodium; less than 2% of: artificial flavors, beta-carotene, biotin, cholecalciferol, chromium chloride, cupric oxide, cyanocobalamin, D-calcium pantothenate, FD&C yellow #5 (tartrazine) lake, FD&C yellow #6 lake, folic acid, gelatin, hyroxypropyl methylcellulose, manganese sulfate, niacinamide, phytonadione, polyethylene glycol, potassium iodide, pyridoxine hydrochloride, riboflavin, silicon dioxide, sodium molybdate, sodium selenite, stearic acid, thiamine mononitrate, titanium dioxide (color), vitamin A acetate. Do not use this product if printed safety seal bearing "Bayer HealthCare" under cap is torn or missing. Store at room temperature. Avoid excessive heat above 40ºC (104ºF).